Derry City's Joshua Daniels with Conor O'Keefe of Wexford Youth's at Brandywell. IT MIGHT not have been the most enticing fixture to whet the appetite and put ‘bums on seats’ after the midseason break, but Kenny Shiels was ‘annoyed’ at the poor attendance for Friday’s victory over Wexford Youths. The Derry City boss says he is ‘at his wits’ end’ with the lack of numbers at the Brandywell venue and the strangely subdued atmosphere. Bearing in mind it’s the beginning of the summer holidays, with fans, perhaps, more interested in the European Championships - added to the fact that the away support was understandably minimal - you can see why there was a paltry 800 people in the stands. But Shiels was hoping the young local lads on show would help galvanise the supporters and create a buzz at Brandywell as they continue to exceed expectations this season. Nathan Boyle’s first half strike ensured City moved clear of Shamrock Rovers in third spot and gained ground on second placed Cork City as the Candy Stripes’ season continues to show great promise. I’m just at my wits end. I want to engage with local people and all I want in return is for people to come out and watch and be proud of your local players. And, in a desperate plea to supporters to return to Brandywell and get behind a largely local side, the Derry boss urged fans to show their pride in his team. “I’m just at my wits’ end. I want to engage with local people and all I want in return is for people to come out and watch and be proud of your local players,” said the Derry boss. Teenagers, Rory Holden and Conor McDermott, and 20 year-olds Josh Daniels and Aaron McEneff formed the midfield of the side which defeated Wexford while 22 year-old local lad, Boyle, produced an accomplished finish to get the second half of the season up and running with a win. 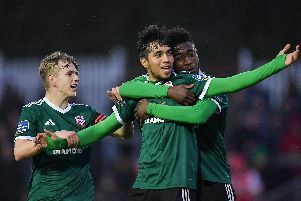 There should be a real sense of excitement building for this new-look Derry City product but, in truth, much of the talk from players and management has, to date, surrounded the club’s ambition to avoid relegation, despite their lofty league position, which has, perhaps, curbed the enthusiasm of supporters. In fairness, Shiels has managed the season in stages and quite rightly tempered expectation with realism and played down talk of a European qualification or, even, a title challenge. But now is, maybe, the time to talk up the club’s chances of launching an assault on the title. Derry now enter a crucial stage of the season with the teams in and around them having more than one eye on their respective European campaigns and, as such, offering them a great chance to further boost their prospects. Indeed, Derry play Dundalk next week, five days before the Lilywhites’ crunch Champions League qualifier against Icelandic champions, FH Hafnarfjordur, and travel to Tallaght to meet fourth placed Shamrock Rovers three days after the Hoops’ Europa League away tie in Finland - surely no better time to take advantage of the leading clubs’ preoccupation with European football. With champions Dundalk up next, the return of ex-City boss, Stephen Kenny, and a first appearance in opposition colours at the Lone Moor Road venue of former favourite, Patrick McEleney, there should be no such apathy. So, ‘come out and get behind your team’ is the clear message from Shiels. For those who did show up on Friday night, there was little to get excited about in a first half with limited chances for the home side while Gerard Doherty was once again in inspired form to deny Wexford’s Andy Mulligan after 17 minutes. One minute later and Boyle gambled on a punt upfield by Aaron Barry, took advantage of a hesitant Wexford defence and lofted the ball over the head of the advancing goalkeeper with a deft finish to give City the lead. Doherty, who Shiels claimed should have been selected by N. Ireland for the Euros, did superbly to palm away Jonny Bonner’s long ranger as the interval approached. In the absence of the suspended Conor McCormack and the injured Harry Monaghan, City struggled to control the midfield battle during the first half. And Shiels quickly moved to rectify it at half-time by replacing Keith Ward with teenager, Holden, who produced an accomplished display. Doherty denied Wexford again on 74 minutes when he put Chris Kenny’s flicked header behind at full stretch. And, from the resultant corner, Gary Delaney’s downward header was cleared off the line by Josh Daniels. Aaron McEneff will be once again cursing his luck as his well executed strike crashed off the crossbar with 10 minutes to go. Substitute Jordan Allen forced a terrific save from Graham Doyle on the volley before his ambitious lob from the halfway line was just off target as Derry finished strongest. It was ‘job done’ in the end and Shiels believes the victory sets his side up nicely for the home clash against the champions next Friday night where he hopes for a better turnout from the home fans. “We would be feeling so down if we hadn’t gained ground on Shamrock Rovers and Cork,” he said. “We gained ground on those two teams which keeps us in the frame and sets us up nicely for the Dundalk game on Friday night. I thought it was a decent performance, if you put it into perspective. You can fall into this trap of underestimating Wexford. They play for long throw-ins and free-kicks. Every time you give a free kick away in your own half, it’s a threat. They’ve got such big players but they also passed the ball quite well. But I don’t think anyone can say that 1-0 flatters us. I know Gerard was sensational and made three really fantastic saves. Their goalkeeper made a lot of saves, too, and we had chances to wrap it up. “You have to give Wexford credit for making a fist of it. Barry McNamee and Rory Patterson are just back after injury and we’ve got Harry Monaghan and Conor McCormack all waiting in the wings to come into the team. Derry City: G. Doherty: N. Vemmelund, R. McBride, A. Barry, D. Jarvis; K. Ward (R. Holden h-t), A. McEneff; J. Daniels, B. McNamee, N. Boyle (C. McDermott 65); R. Patterson (J. Allan 80); Subs Not Used - D. Doherty, P. McClean, R. Doherty, R. Curtis. Wexford Youths: G. Doyle; C. O’Keefe (J. Peare 88), R. Delaney, G. Delaney, C. McCabe; E. Molloy, C. Kenny (S. Dunne 77), J. Bonner, A. Mulligan (C, Whittle 77); P. Murphy; D. Furlong; Subs Not Used - M. Connor, C. Whittle, D. Ledwith, S. Last. Referee - Tim Marshall (Fermanagh).